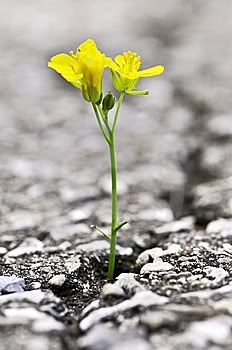 Have you ever seen a flower growing out of a crack in the ground and wondered how in the world it was growing there? How in the world did that tender shoot break through the hard ground and stretch out petals that displayed such splendor? Despite all odds, that sweet little flower stands tall and reaches its full potential. Today, I saw something even more amazing than that determined little flower. I saw true beauty beginning to bloom. I saw it in the faces of these amazing young ladies. They are sponsored children from the Compassion project we visited today, and they are learning how to do manicures through Compassion’s vocational training. Much like the flower breaking through the hard ground, these young ladies are breaking through the cycle of poverty. It’s not gonna be easy for them to bloom. But Compassion is giving them the tools they need to do it. As I sat down at the table for them to paint my nails, I felt so much love for them. I wondered if they new how truly beautiful they were? I wondered if they knew how precious they were in HIS sight? These sweet young ladies have faced trials that our own children will never know. Just like you, I want the best for my children. I want to see them grow and flourish in life. And as I looked at the faces of these young girls…I wanted the same for them. After they were finished doing our nails, I asked the translator to tell the girls something for me. “And you are beautiful because you have beautiful hearts.” I said as I placed my hands on my heart. I pray that they know that God looks upon our hearts. And that a woman is truly beautiful is she has a beautiful heart that knows and loves Jesus. The Compassion project we visited today is also providing vocational training in cooking. 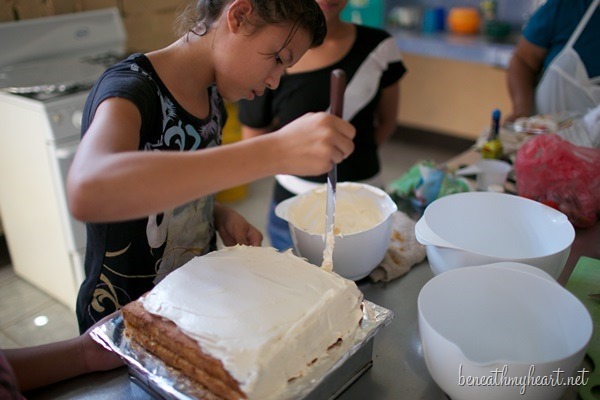 It was such a joy to watch these children learn skills like cake decorating that they could one day use to make money and break free from poverty. These vocational classes not only teach the children a skill, but they also boost their self confidence and help them to believe in themselves. Today I saw JOY beginning to bloom. 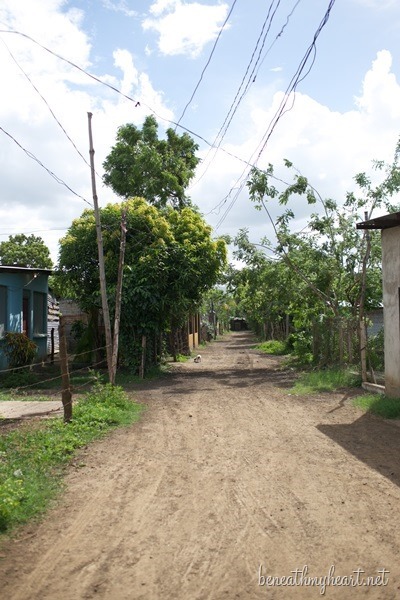 This dry dusty road led us to the home of some children who are also sponsored by Compassion. We were visiting a grandmother who was raising her five grandchildren all by herself in this one room home. I kept looking at that house thinking, “How do people live like this?” I couldn’t wrap my brain around it. In the eyes of sweet Evan. Because of Compassion, this adorable little boy receives an education, regular health check ups, food, and more. But most of all, he receives encouragement from his sponsor. And you are not going to believe who his sponsor is!!! An 18 year old boy from Korea! 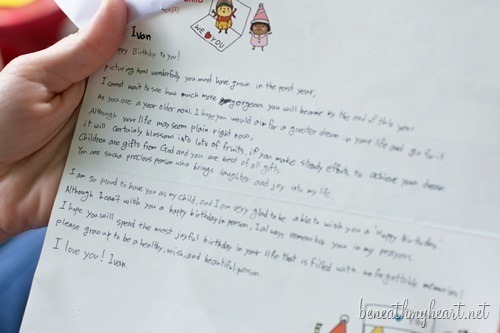 He has written to Evan, and Evan keeps the letters in his house. He brought them out to show us. This letter from his sponsor is like refreshing water being rained down on Evan’s young life helping him to grow into who God wants him to be. Evan was very quiet when we first got to his home. His teachers were with us, and they said he has always been like that and doesn’t talk very much. But when Kristy placed him on her lap and began to do the “pony song,” Evan began to laugh. And laugh and laugh and laugh! His teachers had never seen or heard him laugh like that. What joy it must bring to the Father to see his children laugh like this! God is doing a mighty work around the world through Compassion. But there is more work to be done, more seeds that need to be nurtured so they can grow and bloom. Now, can I get real with you for a minute? What’s holding you back from sponsoring a child? If you are like me, you are thinking you can’t afford it. When I first signed up to go on this Compassion trip, I was told that if I wanted to sponsor a child from Nicaragua, they could arrange it so I could meet him while I was there. Our family already sponsors a child from Equador for $38 dollars a month, and I knew we didn’t have the money to sponsor another child. We have a stack of bills we haven’t paid yet for the surgery I had in March. Jonathan and Luke both need braces for their teeth. Cy has just gone into business for himself, and we are tighter than we have been in a very long time. We just couldn’t afford to sponsor another child. But you know what we could afford? We could afford $20 to take the boys to McDonald’s for lunch. And another $20 to take them to the pool. We were also able to afford about $60 for me to get a manicure and pedicure. And oh yeah! We were able to afford a $60 meal at our favorite restaurant in town just last week. We also could afford to get our car washed, enjoy DISH network on tv, and support my caffeine addiction to cokes from McDonald’s EVERY SINGLE DAY! 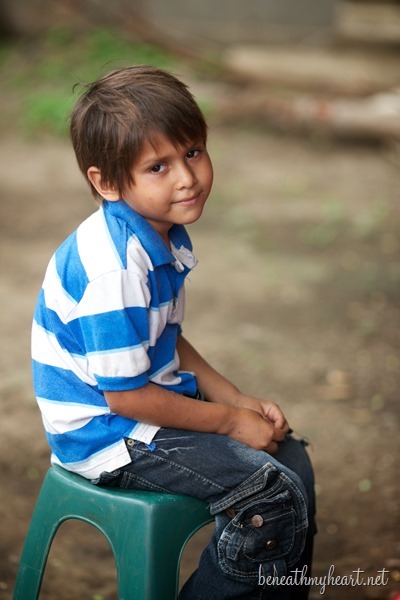 But I knew we just couldn’t afford to sponsor a child in Nicaragua… who sleeps on cardboard boxes for a bed, or whose parents work at a city dump to earn about a dollar a day, or who eats only one meal a day, or only has one pair of shoes. 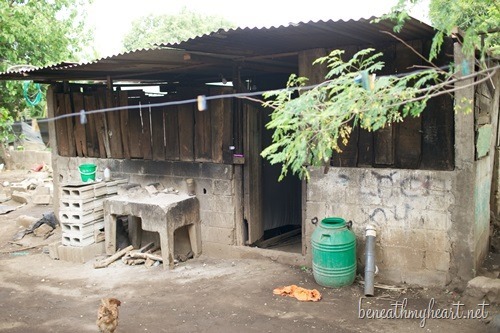 Our tightest month financially would be like a dream come true for many children in Nicaragua. And yet somehow I had convinced myself that we couldn’t afford to sponsor another child. But God started doing a work in my heart, and I became haunted by the thoughts of coming on this trip and staring poverty like I’d never seen before straight in the face. I thought “How will I be able to hug these children without sponsors with the same hands that had just had a $30 new set of nails put on them?” Really? These precious children are so much more important than having pretty nails. I am so glad that God opened my eyes and my heart and led me to sponsor another child in Nicaragua. I would have missed out on the blessing of Cesar, my sweet sponsored child. Now I get to watch God’s beauty bloom in another life. Will you join me? Will you help provide a child the chance to break through poverty and grow to be all that God wants him/her to be? Just click on the banner below. Great post, Traci. I know you all are exhausted. Thank you for writing and sharing your heart with us. Praying that many children will be sponsored through your posts and the reality that Compassion is making a difference. Blessings! Praying also that you will be refreshed and the Lord will provide you with the energy and stamina you need. Your post was wonderful, full of truth and hope and love. And then you had to go and get realer :). Faithfully telling not only the stories of these precious Compassion babies, but faithfully tellling YOUR story, one that challenges everyone of us. Your words are affecting; I know many will be stirred to action as a result. Isn’t that just like God? You give up getting your nails done, so He allows these precious Compassion girls to give you a manicure. Glad you all are having a great trip! Thank you, Ashley. God IS good. Thank you so much for sharing. This brought tears to my eyes and reminded me to look into sponsoring a second child, something I’ve wanted to do for a little while. Thank you thank you. Awesome! Yes! I pray you do sponsor another child. I wish all of my readers could see first hand what I have seen this week. It is beautiful beyond words. Compassion is ABSOLUTELY changing lives through Jesus’ name! I love this statement “These precious children are so much more important than having pretty nails” It almost makes me cry! i’m so happy that you can motivate people and aware them about how to change a child life. i really love people like you that invest their money to release children from poverty in jesus name! Glory to God! Oh, Traci. Bless you. Bless you, my friend. I am so proud of you and so grateful for you. OH yes, true beauty. Thank you for encouraging their hearts and in turn, encouraging ours. I think that day opened my eyes to all the hope that Compassion offers through truly training them in a vocation.for life, so very special. I loved seeing the vocational classes! It was so cool to see these children beginning to “grow” in God’s plan for their lives. Tears Traci. I mean it. Your words are so beautiful, but even more beautiful is the love of the Lord that shines through your heart to these children. Thank you so much for bringing us on this journey with you. Continued prayers being sent your way. Thank you for following me on this journey, Kitty. And thank you for praying for me. I don’t even know you…and I’m proud of you! Getting real helps so many people realize that God wants us to give something up to sponsor a child. It’s only in giving something up in His name that our hearts grow to resemble His. You are right…it’s not about being able to afford it, but being able to see how truly Big and Mighty God is. He’s looking for obedience, not sufficient income. The sufficient part is His, the obedient part is ours. Thank you, too, for speaking love and Jesus into those bright young ladies’ hearts. They will always remember your encouragement. Thank you so much for your encouraging words! God bless you! AMAZING!!! God has been doing a similar work in my heart between my “wants” and what is eternal. I so struggle with being part of the North American “I want” culture and being a true follower of Jesus and following what He says is important. I struggle when my friends “have” and I don’t. I want what they have, but I also want what Jesus wants. Such a struggle. I totally understand, Heidi. It is something we all struggle with. I didn’t really realize how brainwashed we are in our “me” culture until I arrived in Nicaragua on Monday. We have all we need and God calls us to bless others. thank you for sharing. Touching. Praying for all of you….. I am so excited to follow you on your journey. I’m sure your very busy! Thank you for taking the time to update us. I am going to talk to my husband when he gets home about sponsoring a child. I wanted 4 kids. God blessed us with 2 healthy children. He has a different plan for us. We are not able to conceive more but sure would be special to sponsor a child! Wishing you a safe trip and lots of prayers while you continue to do God’s work. Thank you, Christine! I pray you will sponsor a child. The blessings you both will receive will be immeasurable and will have an eternal impact upon the life of a child. Great post! Thank you for getting personal on this one. “Shame on me”. For some reason we always want to be appologetic about asking people to sponsor kids because we all know there is hypocrisy in our lives. We all have it, but that doesn’t mean we shouldn’t all be working on it. I totally respect the honesty. Thank you so much, Steve. It was hard to admit it, but I knew God was calling me to be transparent. You could not have said it better! Amen, sister! Teary and a tinsy jealous that you got to go on this trip. :) Blessings to you and I’ll pray for you while you’re there; He will provide! Living ALERT Christian lives is never boring and certainly never a something to regret!! :) Praying more kids are sponsored through your testimony!!! Tell me, why in the world did the cake, yes the *cake*, make me cry? I don’t know, but it is beautiful. Those kids are talented. 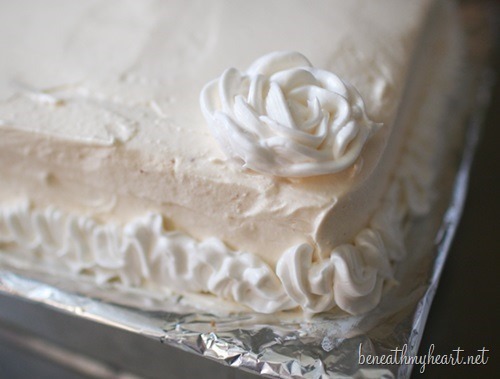 I have made frosting roses before, but my goodness that frosting looked awfully soft, which would make it quite difficult to make such pretty flowers! Thanks for this. You took me where I can’t be right now……. It is a difficult decision to add one more sponsored child to your family, but it is such a blessing. Not only to your sponsored child, but to your own family as well. 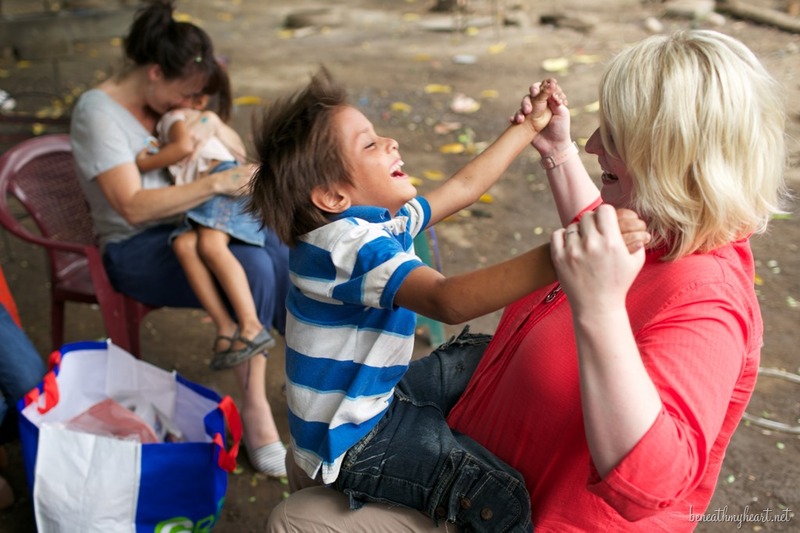 Things we can do without, but loving on these children makes an eternal impact. Thank you for your words today! Thank you for getting real and honest with us. I am humbled to think that I will save money in an emergency fund, but then don’t consider the lives of these children “emergencies”. What a beautiful, challenging post. Thanks so much for sharing your thoughts and challenging us to value what really matters to God! And thanks for the photos of the girls painting nails and cake decorating. 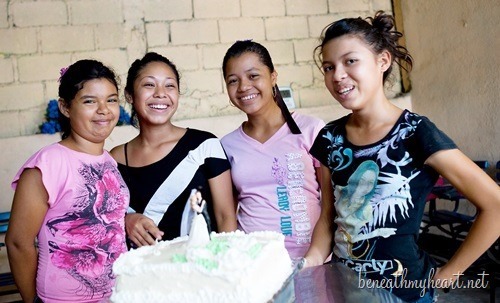 Our 14-year-old sponsored girl in Nicaragua, Julissa, wrote that she is learning cake decorating….your photos brought her letter to mind and helps me to imagine her at her center! Those images of the girls painting their nails just goes to prove – that no matter where you are in the world, girls will be girls! Absolutely precious! “We can’t afford to…..” is such a challenging indictment of MY priorities! LOVE how God is rockin’ your world!